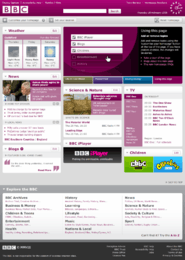 BBC Online, formerly known as BBCi, is the BBC's online service. It is a large network of websites including such high-profile sites as BBC News and Sport, the on-demand video and radio services co-branded BBC iPlayer, the pre-school site CBeebies, and learning services such as Bitesize. The BBC has had an online presence supporting its TV and radio programmes and web-only initiatives since 1994 but did not launch officially until December 1997, following government approval to fund it by TV licence fee revenue as a service in its own right. Throughout its short history, the online plans of the BBC have been subject to harassment from its commercial rivals, which has resulted in various public consultations and government reviews to investigate their claims that its large presence and public funding distorts the UK market. The website has gone through several branding changes since it was launched. Originally named BBC Online, it was then rebranded as BBCi (which itself was the brand name for interactive TV services) before being named bbc.co.uk. It was then renamed BBC Online again in 2008, however the service uses the branding "BBC". The web-based service of the BBC is one of the most visited websites (fifty-fifth most visited according to Alexa in January 2013) and the world's largest news website. As of 2007, it contained over two million pages. The BBC Director General John Birt sought government approval to direct licence fee revenue into the service, describing planned BBC Internet services as the “third medium” joining the BBC's existing TV and Radio networks, achieving a change in the BBC Charter. This led to the official launch of BBC Online at the www.bbc.co.uk address in December 1997. Beeb.com was later refocussed as an online shopping guide, and was closed in 2002. beeb.com now redirects to the BBC Shop website, run by BBC Worldwide. In 2001, BBC Online was rebranded as BBCi. the website launched on 7 November 2001. The BBCi name was conceived as an umbrella brand for all the BBC's digital interactive services across web, digital teletext, interactive TV and on mobile platforms. The use of letter "i" prefixes and suffixes to denote information technology or interactivity was very much in vogue at this time, according to the BBC, the "i" in BBCi stood for "interactivity" as well as "innovation". As part of the rebrand, BBC website pages all displayed a standard navigation bar across the top of the screen, offering a category-based navigation: Categories, TV, Radio, Communicate, Where I Live, A-Z Index and a search. The navbar was designed to offer a similar navigation system to the i-bar on BBCi interactive television. On 30 January 2010, a new webpage design became available as a beta version, that by May 2010, replaced the old homepage. This homepage expanded on the modules idea and the customisation theme. The website allowed certain themes that interested the viewer to be tracked, via a new module. It also included a new 'Media Zone' where featured content could be displayed, with this new featured box being located across the entire top of the webpage, below the header. The Media Zone was also changed so that the content changed by running the mouse over the tabs. The header was again changed to include the headings of the major sections of the website, these being: Home, News, Sport, Weather, iPlayer, TV, Radio and more, spread out evenly across the header. This new header was included across the entire website. Despite the cosmetic appearance of the relaunch, the new website was actually relaunched using a completely different operating system, allowing the site's four different international versions to be changed and altered easier. It also brought their website layouts and operations closer to that of the main website. BBC Programmes is a service of BBC Online which provides a page for every television and radio programme broadcast by the BBC in the United Kingdom. It was launched in October 2007 and gives each programme an eight digit alphanumeric identifier which is used to provide a permanent URL. It currently only holds data from the launch date plus a selection of high-profile programmes (notably Natural History programmes and Radio 4 programmes), but Jana Bennett, Director of BBC Vision, said in June 2008 that the BBC will eventually add a page for each programme it has broadcast over its history to the service. For example, the Food site contains recipes featured on various BBC cookery programmes, the History site has an interactive timeline of key events and individuals, the Nature site contains a database of creatures, and the Language site teaches phrases and more in 40 languages. Included in this range was the well received Your Paintings website that cataloged every painting in public ownership for view. Culture which is a fusion of videos and images coupled with editorial content from a host of well-known and respected journalists and commentators, offering an alternative lens on global trends across the arts. Future which is universal topics focused on future trends in the worlds of science, technology, environment and health. Capital which is dedicated to offering a global perspective on economic stories, trends and profiles on a personal level. Autos which is an entertaining, insightful daily read focused on the passionate side of the motor industry, including design, technology and community. Travel which is an intriguing site about all aspects of travel. are only available to users with IP addresses outside the UK. UK users attempting to visit these sites are told: "We're sorry but this site is not accessible from the UK as it is part of our international service and is not funded by the licence fee." On 15 July 2005, the BBC announced that the site was closing as of the end of the month, although the Doctor Who section would be unaffected as the series was an ongoing BBC concern. The announcement explained that this was "part of the restructuring of the BBC's online activities". It was promised that some of the content would be moved to new places on bbc.co.uk, although as of March 2013 it is currently still all online at the no-longer-updated Cult site. In recent years, some of the content covered in the Cult section was included in the BBC's Archive section, such as content and information on the 25th Anniversary of Children's BBC. The BBC Guide to Comedy was an online encyclopedia based on Mark Lewisohn's 1998 book The Radio Times Guide to Comedy. It offered "Info on every TV comedy shown in the UK, from 1936 to today..." and featured articles on almost every comedy programme and sitcom produced by the main channels in the United Kingdom. The site also featured video clips, viewable in RealPlayer, and a small gallery of cast photographs or screenshots. It was replaced by a smaller, less detailed guide in 2007, which only focussed on BBC shows and is also now discontinued. The BBC's site was initially entirely free from advertising, this was due to the BBC's funding, derived primarily from compulsory television licence fees from UK viewers. BBC Worldwide who exploit BBC brands commercially have had several attempts at launching services online including Beeb.com in the late 1990s. ↑ "Bbc.co.uk Site Info". Alexa Internet. Retrieved 2014-09-27. ↑ "BBC launches PSB partnerships" (Press release). BBC Press Office. 11 December 2008. Archived from the original on 14 December 2008. Retrieved 13 December 2008. 1 2 3 "BBC News – BBC to cut online budget by 25%". BBC Online. 24 January 2011. Archived from the original on 25 January 2011. Retrieved 24 January 2011. ↑ "The BBC is launching an on-line service...". The Sunday Times. 17 April 1994. Quoted in Connor, Alan (25 December 2007). "The WWW Info-Rainforest". BBC Internet Blog. BBC. Retrieved 2 October 2008. ↑ "Internet Archive Wayback Machine". Web.archive.org. 29 October 1996. Archived from the original on 1 June 2002. Retrieved 1 October 2012. ↑ "Worldwide Press Office – beeb.com motoreasy". BBC. Retrieved 1 October 2012. ↑ Claire Billings (23 April 2002). "BBC Worldwide to close Beeb Ventures". Brand Republic. Retrieved 1 October 2012. ↑ "BBCi heralds new interactive era". BBC News. 7 November 2001. Retrieved 2 October 2008. ↑ "What is BBCi?". BBC. 15 December 2002. Archived from the original on 15 December 2001. Retrieved 2 October 2008. ↑ Gibson, Owen (12 November 2001). "A fresh i for BBC". The Guardian. London. Retrieved 2 October 2008. ↑ "What is BBCi? – On the web". BBC. 15 December 2002. Archived from the original on 15 December 2001. Retrieved 2 October 2008. ↑ "BBC website gets new look and new name: bbc.co.uk". BBC Press Office. 4 May 2004. Retrieved 30 September 2008. ↑ London (1 January 1970). "BBC – Homepage". Id.bbc.co.uk. Retrieved 1 October 2012. ↑ Thornett, James. "Redisigning the BBC Online Homepage". BBC Internet Blog. Retrieved 17 October 2011. ↑ Thornett, James. "A New Homepage for BBC Online". BBC Internet Blog. Retrieved 30 November 2011. ↑ Thornett, James. "BBC Homepage Three Months On". BBC Internet Blog. Retrieved 17 April 2014. ↑ 71st Annual Peabody Awards, May 2012. ↑ Hudson, Clare (12 June 2012). "Homepages for Scotland, Wales, and Northern Ireland". BBC Internet Blog. BBC. Retrieved 25 March 2013. ↑ Huggers, Erik. "BBC Online's top level directories". BBC Internet Blog. BBC Internet Blog. Retrieved 11 November 2011. ↑ "The ups, downs and ups of BBC News online". BBC News. 12 December 2012. Retrieved 25 March 2013. ↑ O'Riordan, Cait (1 February 2012). "Launching the new BBC Sport website". BBC Internet Blog. BBC. Retrieved 25 March 2013. ↑ Howell, Liz. "New look for BBC Weather website". The Editors Blog. BBC. Retrieved 25 March 2013. ↑ Walpole, Sophie (5 November 2007). "A Page For Every Programme". BBC Internet Blog. BBC. Retrieved 9 January 2010. ↑ Scott, Tom (18 October 2007). "Ladies and gentlemen I give you BBC Programmes". derivadow.com. Retrieved 9 January 2010. ↑ West, Dave (11 June 2008). "BBC to expand web programmes database". Digital Spy. Retrieved 9 January 2010. ↑ "Languages". BBC. Retrieved 20 September 2013. ↑ Cohen, Nick. "Your Paintings: Opening up the nation's art collection". BBC Internet Blog. BBC. Retrieved 24 April 2013. ↑ Gluckman, Dan (5 April 2013). "BBC Health website closure". BBC Internet Blog. BBC. Retrieved 24 April 2013. ↑ Sizemore, Chris (18 April 2013). "Knowledge & Learning Beta: Welcome to the new site". BBC Internet Blog. BBC. Retrieved 24 April 2013. ↑ "CBBC – Home: The Official Homepage for CBBC". BBC. 1 January 1970. Retrieved 1 October 2012. ↑ "Student Life – Homepage". BBC. 17 April 2008. Retrieved 1 October 2012. ↑ Archived 20 December 2006 at the Wayback Machine. ↑ "BBC launches Democracy Live". BBC News. 2 November 2009. Retrieved 25 March 2013. ↑ "BBC launches Democracy Live". BBC. 2 November 2009. Retrieved 25 March 2013. ↑ "Connected Studio". BBC. Retrieved 25 March 2013. ↑ Woolard, Adrian. "Connected Studio: Launching Phase One". BBC Internet Blog. BBC. Retrieved 25 March 2013.